Used as we are to being accused of being extravagant users of energy, the recent report from the Energy Information Administration (EIA) is an eyebrow raiser. 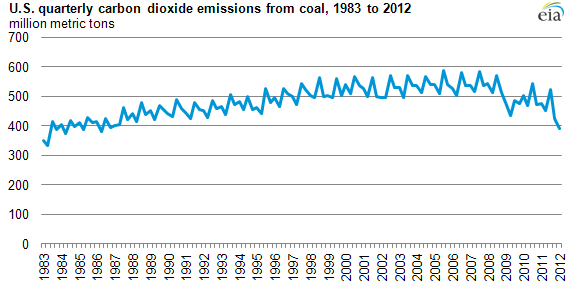 It states that the US carbon emissions from energy use dropped to levels not seen since twenty years ago. Before you pop the Champagne (and thus adding CO2 to the air! ), these statistics are just for the first quarter of 2012. And in examining the principal factors one is forced to conclude that the country has, in golf terms, received a mulligan (thank you Tim Profeta at Duke for that characterization). The accompanying analysis by the EIA is sparse. They ascribe three reasons. One is the warm winter and associated reduction in use of heating fuels. But these are quarter to like quarter comparisons. We have had warm winters before in the last decade. The other two reasons are more interesting from the standpoint of a go forward national policy. Cheap shale gas driven a switch from coal to natural gas in the generation of electricity is clearly a big factor. For the oldest coal plants it was more cost effective to switch to gas rather than to retrofit pollution control equipment. To the extent this startling carbon mitigation statistic has been discussed at all, the principal attribution has been to this factor. Studies making the direct quantitative connection are not in evidence. But, the underlying assumptions regarding the near halving of CO2 from substitution of gas for coal are not disputed. Activism by Sierra Club and others continues to shut down coal plants. One could therefore reasonably expect continuation of this trend towards gas substituting for coal. New wind generation capacity can also be expected, but not as fast. The third reason cited by the EIA is reduced consumption, largely attributed to the recessionary conditions. The concurrent high gasoline prices likely were a factor. Whatever the reasons, gasoline consumption has plummeted in the last nine months, from about 9.1 million barrels a day in June, 2011 to 8.5 in April, 2012. An improving economy ought to moderate this drop rate even if oil prices remain high. Looking out to the next two decades, we have the federal target for a drastic improvement in the fuel efficiency of vehicles: 45.4 miles per gallon by 2025. New vehicles today average 24 mpg. This near doubling in fuel efficiency ought to have direct effect on emissions per mile driven. But there is always Jevons’ Paradox to worry about. Jevons was an economist a century and half ago who predicted that when devices become more efficient people simply use them more, thus offsetting the efficiency improvement. Modern economists term this the rebound effect. In the automobile example, this could entail per capita miles driven to go up because the consumer would note the reduced cost per mile. To the extent that this happens, the positive effect of increased efficiency on CO2 emissions would be dampened. In a recent discussion the economist Richard Newell at Duke, who until recently headed the aforementioned EIA, opined that the rebound effect would be relatively small in this case. For most people work related miles are a principal component. This is not going to change just because the cost goes down. But fuel economy standards apply only to new vehicles. So they will take a while to become a major factor. Earlier gains would be made through fuel substitution with less polluting alternatives. The simplest ones are natural gas vehicles for public transport and light duty vehicles. Another straightforward thrust would be substitution of up to 25% diesel with di-methyl ether (DME) without engine modifications. DME from cheap natural gas would cost much less than diesel, has zero particulate emissions and a very high cetane rating. Particulates (with associated health effects) are a less publicized target for mitigation. The deployment of DME in the diesel infrastructure could be almost immediate in the case of captive businesses such as fleets for vehicles, and compressors and pumps for all manner of industrial endeavor, including fracking for gas and oil. While this country can take some satisfaction from the carbon mitigation statistic we cannot rest on those laurels. We may indeed have been granted a mulligan by the coordinated effects of shale gas related coal substitution and a weak economy using less energy. A tax on emissions, implicit or explicit, is not on the cards. We need policy that is industry and consumer friendly and yet effective in reducing emissions. Natural gas substitution of coal and increased proportion of renewable energy will likely continue. We need a national policy and associated research that makes deep inroads into substitution of oil based transportation fuel with less polluting domestic alternatives. As I’ve mentioned before, I’m not convinced that natural gas prices are going to stay low forever! You mentioned a couple of reasons that this is going to be the case; 1) utilities replacing coal fired power plants with natural gas plants and (2) switching any substantial adoption of natural gas by the transportation sector. Combine this increased demand for natural gas with the soon to be complete transformation of the LNG IMPORTATION stations to EXPORTATION to the world market and gas prices are going to go right back up! In the long run, the decommissioning of coal plants is a good thing because I doubt that when gas prices go back up that the utilities make the switch back to coal, However, I sincerely feel that our industry and our society is taking far too short a perspective on the current glut of natural gas that is on the market. Mark my words!!! In a few years people are going to be scratching their heads wondering where the cheap gas went! You are currently reading US GETS A MULLIGAN IN CARBON MITIGATION at Research Triangle Energy Consortium.